"Great for tacos and quesadillas, these tortillas also have added flavor and fiber from oat bran." In a large bowl, stir together the flour, oat bran, baking powder and salt. Gradually stir in boiling water. Knead the dough on a lightly floured surface for about 5 minutes, then cover and let rest for 10 minutes. Divide the dough into 32 golf ball sized portions, and roll each one into a ball. Flatten each ball using a rolling pin or tortilla press to about 4 inches in diameter and stack them up to keep from drying out. Heat a skillet or griddle over medium heat until hot. Roll out one tortilla at a time until paper thin or as large as your skillet. Cook over medium heat until bubbles form on the top. Turn over and cook on the other side until starting to brown. Stack cooked tortillas while making the others, taking care not to over cook, or you will end up with crackers. 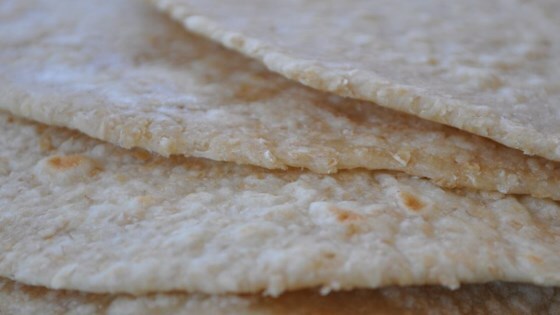 Make your own tortillas to use in soft tacos, quesadillas, or your favorite dish. These had to go right into the trash. They would not roll out. The one that I did make looked like a mess and tasted terrible. I would not make these again. These were so good, and easy to whip up. I will never buy tortillas again. I had horrible luck with these,did not stick together, nor roll out decently. Won't make these again !!! My entire family thought these were delicious. No problem rolling out and also found it unnecessary to oil the pan to cook them. Used whole wheat flour. Will make these again and again.